All tracks concealed.as for all Fimes wardrobes. 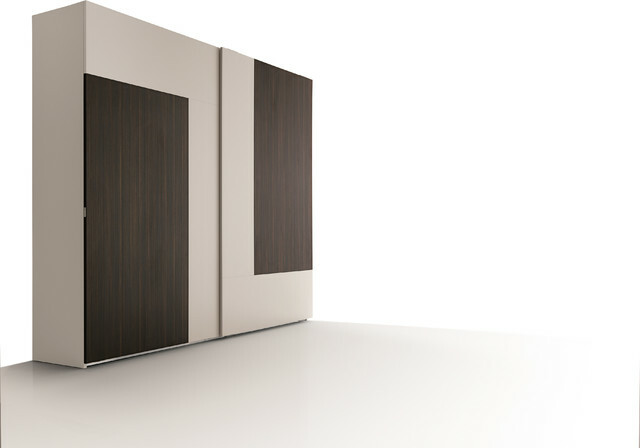 Virtually unlimited choice of materials, colours and finishes including matt or high gloss laquers in many colours, walnut, open pore, wenge melamine, burnt wood, mirror or a combination of these. . Wardrobes up to 2600mm and widths in modular units or custom design. Unlimited fit-out options: hanging, draw units, pull out trouser rack and much more. This is another idea for sliding wardrobe. It would be used to get a nice contrast - the wood veneer could match the floor color and the other could be painted gray or some other color - based on the other theme of the room. Property styling to Salter Point.